Yesterday was Amethesto’s birthday and I spent the day making her chocolate chip pancakes, apple pie, cheeseburger sliders, spaghetti and garlic bread. It felt like I was in the kitchen pretty much all day. I like cooking but that is a bit much in one day! Tonight’s dinner was chicken fried rice which was easy. Such a nice break from yesterday! I used my food processor to quickly shred and chop the vegetables. If you have leftover chicken or rice you can use it in this dish and save some time. When we get food from a Chinese restaurant we always get chicken fried rice. It is the only thing Amethesto will order. 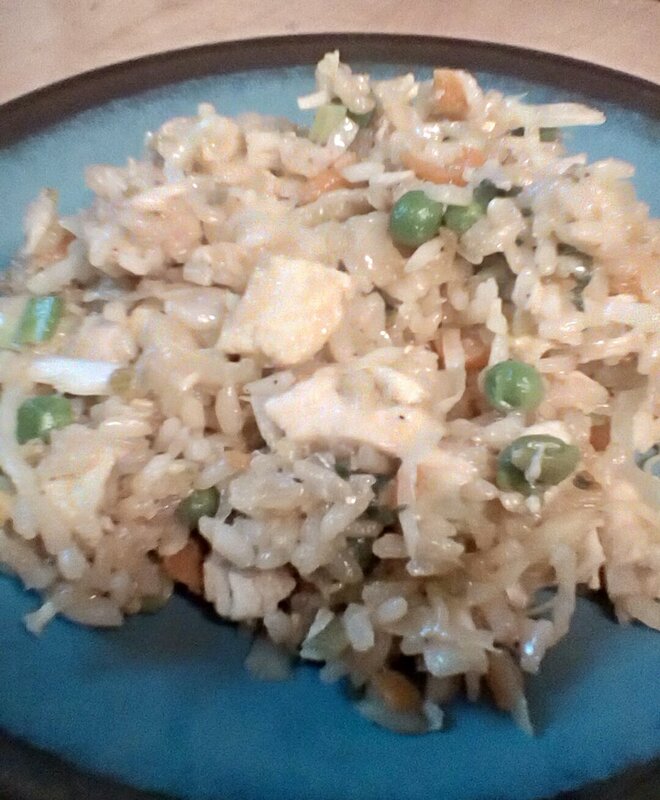 I’ve tried several different chicken fried rice recipes at home and my family likes this version pretty well… even my picky eater likes it. Hagbard likes taking the leftovers with him to work for his lunch. Heat 1 T of oil in pan over medium heat. Mix egg with soy sauce and sesame oil. Add egg to pan and cook until set. Flip over and cook the other side briefly. Cut into small pieces and set aside. In a large pan, add 1 T cooking oil and heat over medium high heat. Add onion, carrot, and celery. Cook 8-10 minutes. Add chicken, peas, cabbage and cook 2 minutes. Add 1/2 T oil, rice, green onion, garlic powder, black pepper, soy sauce and egg. Cook 1 minute.